Re Nu By Bausch & Lomb – when it comes to comfortable , healthy contact lens wear, the cleaning regime selected for your contact lenses makes all the difference. Renu multipurpose solution provides a cushion of comfort for your contact wear. It has a unique formula which disinfects the lenses , getting rid of unwanted germs germs yet it is gentle on the eyes. 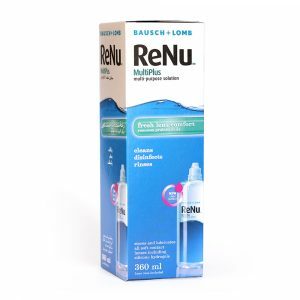 Renu rewetting drops provide the moisture that your eye needs whilst wearing contact lenses. It can be used with all types of soft contact lenses. It provides a great relief in environments which dry out they air for example, during air travel, air conditioned offices or homes.